Nearly 21 months into the Trump Presidency, the recession that the chief economist for the Democratic Party predicted would start three months ago still hasn’t arrived. Instead the economy is growing at a rate of 4% a year, and the World Economic Forum has the U.S. back at the top of its global competitiveness ranking. We don’t cite Mr. Summers’ prediction to embarrass him—everyone makes mistakes—but to point out what almost no one is talking about during this midterm election campaign: Pro-growth economic policies are on the ballot. Not that you can tell from the election noise. Democrats say the most important issue is Donald Trump, and Donald Trump agrees. The President would rather talk about Stormy Daniels and Elizabeth Warren than the economy, and many Republicans have decided that they’d rather talk about immigration than the tax reform and deregulation that have spurred the best run of economic growth since 1999. Yet if Republicans keep their majority, the economy will be a major reason. They haven’t sold their tax reform well, but the growth that it has produced has given them a nine-point edge over Democrats on the economy in a summer Pew Research poll, and improved the public’s sense that the country is moving in the right direction. Gallup finds public satisfaction with the way things are going at 37%, 10 points higher than a year ago. Only 12% say the economy is the country’s most important problem, a reflection of better times. The nearby chart shows the shift in the growth trend by quarterly change in GDP over the last four years. The economy barely avoided recession at the end of 2015 and grew by less than 2% over eight consecutive quarters through March 2017. Growth has accelerated since as consumer and business confidence have surged. 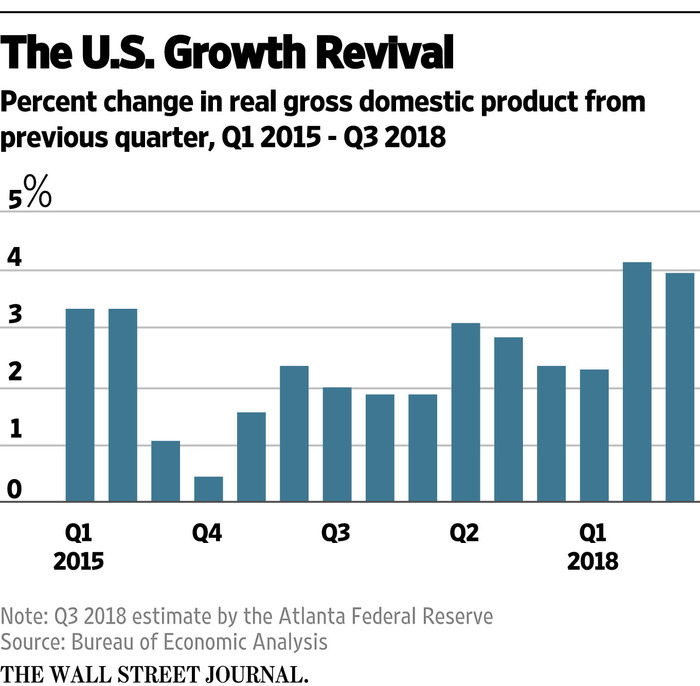 The Atlanta Federal Reserve estimates that the economy grew by 4% in the third quarter, after 4.2% in the second. The political point to keep in mind is that none of this was inevitable. It was the result of a decisive and deliberate policy shift that began with the arrival of the Trump Presidency allied with a Republican Congress. The stock market began to surge on the day after the election in anticipation of pro-growth policies and the liberation of animal business spirits. Deregulation lifted the visible foot of government off business, and tax reform broke the logjam on investment created by the highest corporate tax rate in the developed world. Congress overrode late Obama-era rules no fewer than 16 times with the Congressional Review Act, freeing businesses to invest in new opportunities rather than paying to meet new federal regulation. Barriers to oil and gas production and transport were lifted. Capital investment has surged, exactly as some of us predicted. This was the great deficiency of the Obama expansion, as companies took fewer risks. U.S. oil production is now leading the world again and exports are surging. Bank lending has increased and businesses have had to bid up wages as the job market has tightened. The Labor Department announced this week that its survey of job openings reached a new high of 7.1 million in August. All of this has helped the U.S. avoid the recession that might well have happened if Democrats had won and taken Larry Summers’ policy advice. U.S. growth is now driving the world economy, not retarding it. The World Economic Forum specifically cites America’s entrepreneurial culture, flexible labor market and vibrant financial system as economic strengths. Reviving all three was the explicit goal of the GOP growth strategy after the Obama-era policies had squashed them. The question that is too much below the surface of next month’s election is whether Americans want to continue this prosperity. The growth revival isn’t guaranteed to continue and could be slowed considerably with the return of anti-growth policies. We’re not sure voters or markets fully appreciate the anti-growth risks. The last time Ms. Pelosi was House Speaker, she persuaded George W. Bush to take Mr. Summers’ advice of short-term “stimulus” that lifted GDP for a quarter but then sputtered. Democrats also passed an energy bill that wasted tens of billions on green boondoggles. And that was under a Republican President. Some Americans think the worst we could get is virtuous policy gridlock, but don’t be so sure. The GOP Congress reinforced Mr. Trump’s best economic instincts and at least offered some rhetorical resistance to his trade protectionism. Democrats will support his tariffs, and maybe demand more, while trying to repeal his tax and deregulation policies. Mr. Trump will have the veto pen, but Democrats are already planning to use the debt limit debate in 2019 to force him to accept higher tax rates on business and individuals. They might also pair higher taxes with more spending on public works that Mr. Trump promised in 2016. Will Mr. Trump hold firm without the reinforcement of a Republican House and Senate? We’re not at all sure of the answer. One problem with prosperity is that it can lull people into believing it will continue. Voters focus on other priorities. Let’s hope they understand the economic stakes on Nov. 6.